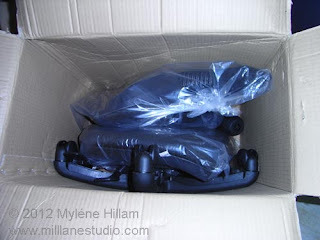 Mill Lane Studio: What's in the Box? Exciting day, today! I took delivery of two new chairs for the studio. 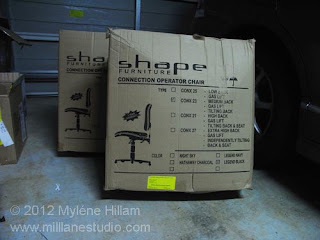 Well, at least, I got two boxes with chairs in them. Empire Furniture are having a sale on these chairs at the moment and they match the chairs I already have in my studio..... YAAAAY! 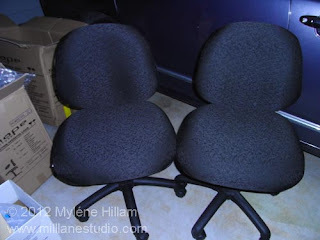 On top of that they are taking an extra $50 off each chair for their existing customers..... Woohoo! What more could I ask for?!! When I picked them up, the kind gentleman asked me if I'd like them put together for $30 each. When I asked him how long it takes, he said about 2 minutes. Umm, I'm no maths genius, but that works out to $15/minute. I don't think so. 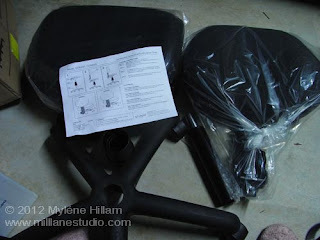 I'm a dab hand when it comes to assembling Ikea furniture so I'm sure I can tackle these and I'll keep the $60 thanks! So tackle them I did! The first one took about 10 minutes because I got to this point and didn't understand the next instruction. But the second one took only a couple of minutes as promised! Come Saturday morning, I won't be scavenging every spare chair in the house for my resin workshop. Lucky students.... brand new, ergonomic chairs. 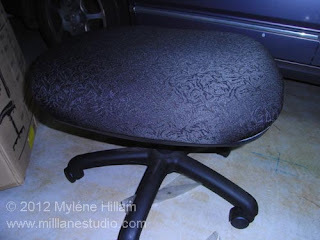 Next chair I want is a stool on wheels to scoot around the studio. I'm eyeing off the one my hairdresser uses in her home salon - I think she'll have to keep a close eye on it! Nice chairs! Totally worthwhile too. Yeahhhh... very nice! Good chairs are important when you're sitting for long periods.